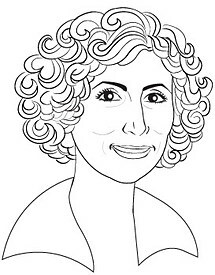 Sherrie Rose, author, internet entrepreneur and webinar coach, well known by her pencil-sketch profile illustration. One of the best ways to build relationships and have people get to know, like and trust you is a webinar. On a daily basis Sherrie spends her time as a webinar coach helping entrepreneurs and promoters maximize the power of webinars for more leads, more sales, and a better connection with customers around the world. As you broadcast your way to success with webinar fame, the importance of Liking and Authority are major factors as described in Pillar 5 in the book, The Webinar Way. These two principles made famous by author Robert Ciadlini because "People prefer to say 'yes' to those they know and like," and "People respect authority. They want to follow the lead of real experts." Webinars (web+seminar) come in many forms and on many platforms including Google Hangouts on air. Sherrie's a master at networking and opening hearts and minds (and in the business arena, closing sales). Sherrie says: "Share. When you see a person without a smile, give him yours." And, online, give a #LikesUP !!! Motto: The Real Currency is "Relationship Riches"